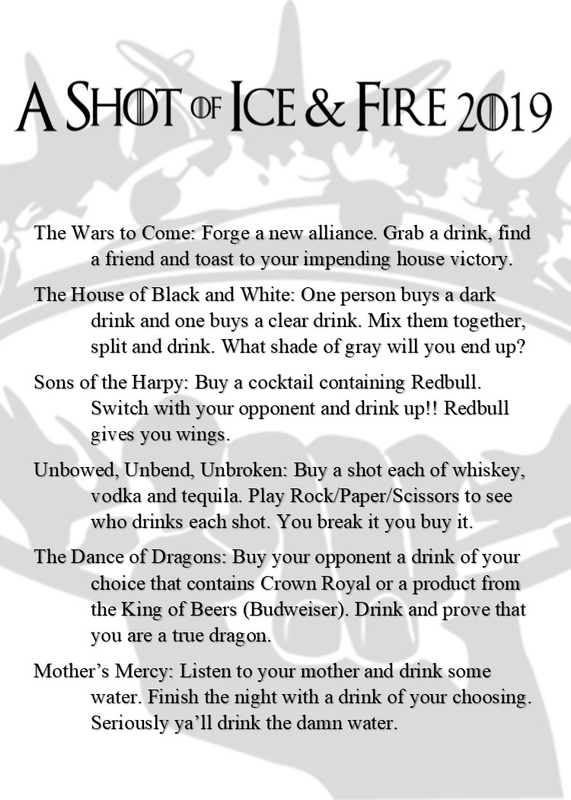 Welcome to A Shot of Ice & Fire: Book Five, otherwise known as the Fifth Annual PAX South pre-PAX Community bar crawl! In staying with PAX tradition, the Thursday evening prior to PAX will see a huge group of us crawling through the San Antonio Riverwalk, drinking, making friends, and raising money for Child's Play. There will be houses. There will be drinking challenges.  There will be sigils. Be prepared, because PAX South is coming. Through hill and dale, through rain and fog you and your companions push on. Challenge after challenge you are overcome with the haze of battle…your memory will flicker…you can barely piece yourself together, but know you have brought honor to house and can proudly bear your sigil. Welcome to the PAX South version of the PrePAX bar crawl. You may have attended one of the other PrePAX bar crawls: The Triwizard Drinking Tournament or the Pokecrawl. Or, if this is your first PAX, maybe not. In any case, this is a bar crawl. A Game of Thrones-themed bar crawl designed to get you drunk and meet fellow PAXers, all while raising money for the Child’s Play charity. This means we will ask you for donations. There will probably be cool things auctioned off. Don’t be stingy - bring some extra cash and think of the children. When you arrive at the first bar, your Lord or Lady and his noblemen will check you in (see below for registration details). You will receive a registration card with some very important stuff on it. 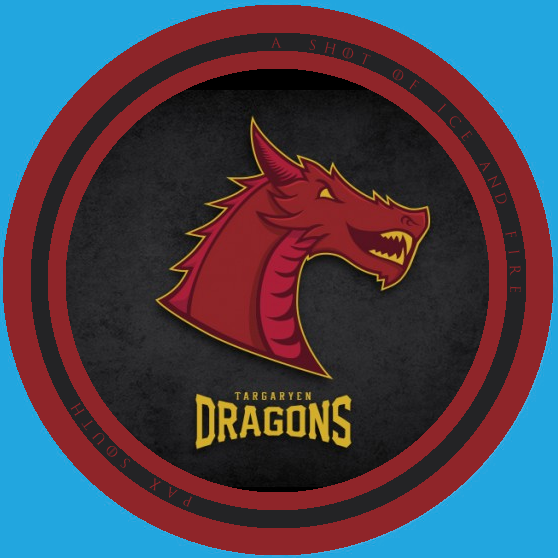 You will also receive six buttons with your house sigil upon them. At each bar, you will single out the weakest member of the opposing house and challenge them to a duel. 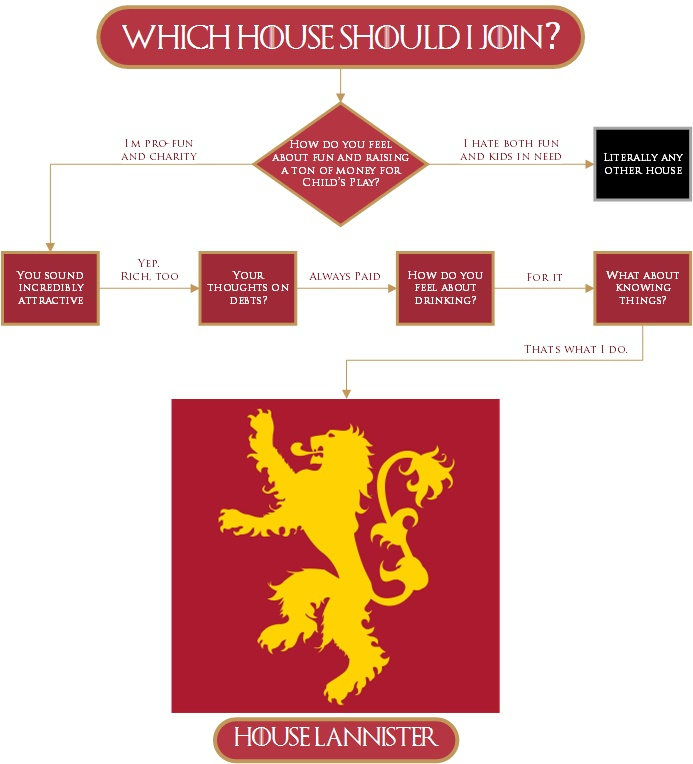 Once you have completed the duel (and hopefully bested them), take their house sigil as a sign of your superiority. And then give them one of yours, just to be nice. Your goal will be to collect all six sigils to show the world that you rule the seven kingdoms…..or just that you have a liver made of Valyrian Steel. You will be able to register yourself and a +1. Any duplicate registrations will be deleted, so don’t try to fool us. When registration opens, it will not have a wait-list due to the functionality of Eventbrite. Any cancellations or spots that open up will immediately go back into the pool. You will need to bring a printout of your registration confirmation or have it available on your smart device when you check in at your first bar. We will ask that everyone donate at least $10 for Child's Play to receive the scorecard and house buttons. Please note that the minimum donation has been raised this year. There's really no winning, per se. This is pretty much a fun, drunken night out with fellow nerds. 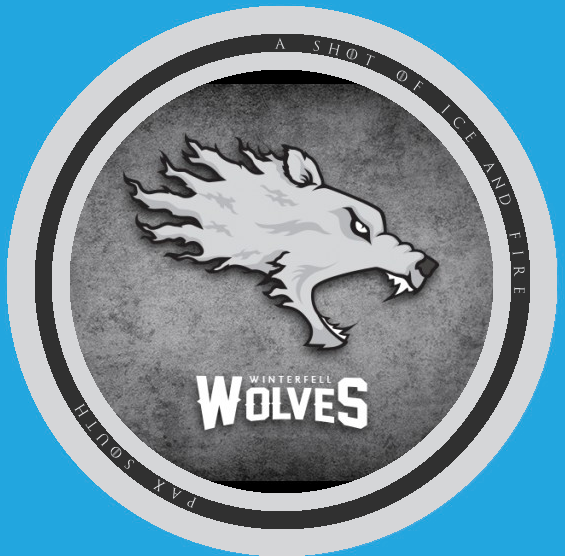 But for those of you who do manage to conquer all of your foes and collect their sigils, there will be a button confirming the fact that you have lived through Book Five. We're also raising money for Child's Play, so bring some extra cash and for the love of the Gods old and new, think of the children. The House that raises the most will be declared the most bestest house ever (at least for this year) and will have bragging rights going into Book Six. We're always accepting volunteer spots as noble helpers or Wardens (sober assists) - it requires herding your brethren from one bar to the next, and making sure we don't lose any of our bannermen along the way. This is a great option for those that don’t feel like waking up hungover on Friday, but still like the energy and social spirit of the crawl. We prefer our volunteers mostly sober. Sober-ish. Ok, not falling down. Please PM Etaoin if you're interested in assisting. Know Your Limit: The only person who knows your alcohol tolerance is you. There's nothing worse than an overindulged drunk so don't be that guy or girl. If someone notices that you're getting sloppy, you're already past the point of no return. You should probably stop drinking when someone points out to you that you're peeing on a bar stool. I don't know if I'm looking at the post wrong, but I can't find the sign up link. Is it available now or not until closer to the event? It's not available yet, I'm sure the OP will be updated when it is. We open up registration about a month before the event. It's almost that time again brothers and sisters of the Night's Watch. Time to show the other houses of Westeros that Crows have the strongest livers in all the seven kingdoms! Hi, my name is Matt aka Animal and I will be your Lord Commander for the pre-PAX South pub crawl this year. I've been a regular crawl member here in SA (I'm a local) for the last 4 years with a different house so I have a good idea how the event flows and I'm really excited for the chance to step up to a larger role and help raise a ton of money again for Child's Play. Being a crawl vet, I understand that some houses have yearly traditions they've upheld such as activities (like inducting a person into the Watch) or particular items sold/auctioned that are unique to this house. 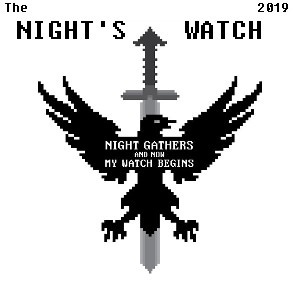 I want to respect those traditions so I'm calling out to previous crawlers of the Night's Watch (hopefully returning as well) to inform me of some of those things so I can hopefully continue on with what's brought you back to this house each year. Thanks for listening and being Night's Watch members, I can't wait to hear from you and to see you all in January. 1.Registration opens December 20th at 9am cst. Reminder - You are limited to reserving 2 tickets. I personally check each order as it comes in to make sure that no one is getting tricky. Calling all Free Folk! It is time once again to unite and raise a drink (and money) for the children! I’m Jennifer (aka Adritha) and I will be your Spearbearer for this year’s crawl. 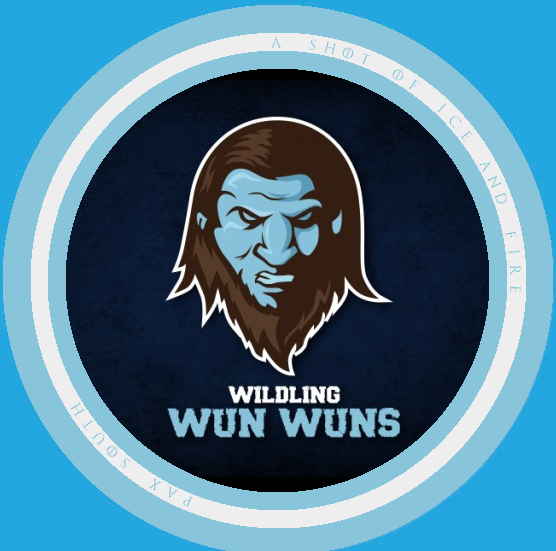 I have served the Wildlings as Master of Bones the last couple of years, and am excited to take up the lead mantle of this great group of people. While this crawl is always fun and filled with drink, it is still a charity fundraiser. Remember to bring cash for goodies and donations. If anyone has any crafty skills or fun items they are willing to donate to the auctions, please reach out to me either here or through the Facebook group. Together, we can make this crawl amazing, and rise above those Southern kneelers (in terms of money raised). We are the Wildlings, and we don't kneel for anyone beyond the Wall! 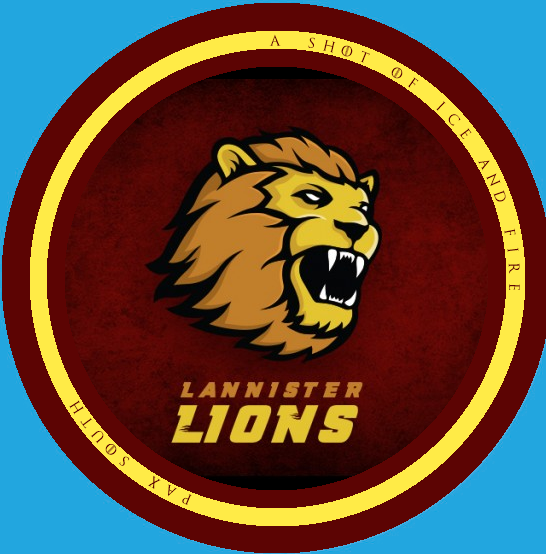 House Lannister welcomes back all of our Lords and Ladies, and we look forward to greeting our newest members. We've got another year of awesome swag and surprises this year, especially for those who open their purses for charity. We look forward to seeing everyone in less than a month! 13 days left to register and the Houses are filling up fast! Challenges have been added to the OP. 2 houses full, with a 3rd close behind. Don't wait until the last minute! 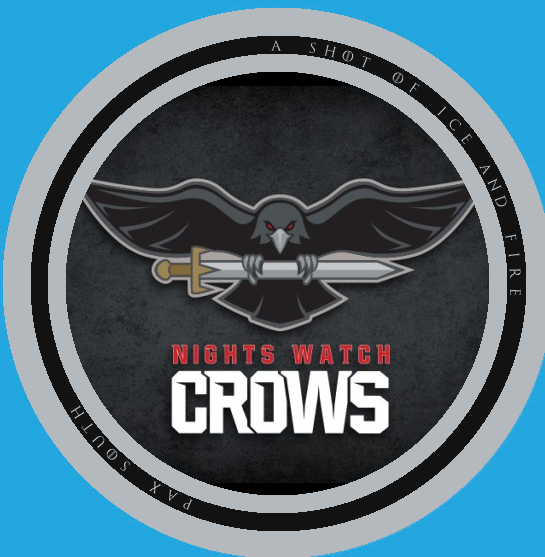 One more spot open for the Night's Watch! Exactly how do the challenges work? I’m new to the crawl, so I’m a bit confused. When you show up at your first bar to sign in (with just your house), your house lead will hand you a card with your house sigil on one side and the challenge instructions on the other, as well as a bag of 6 pins with your house sigil on them. 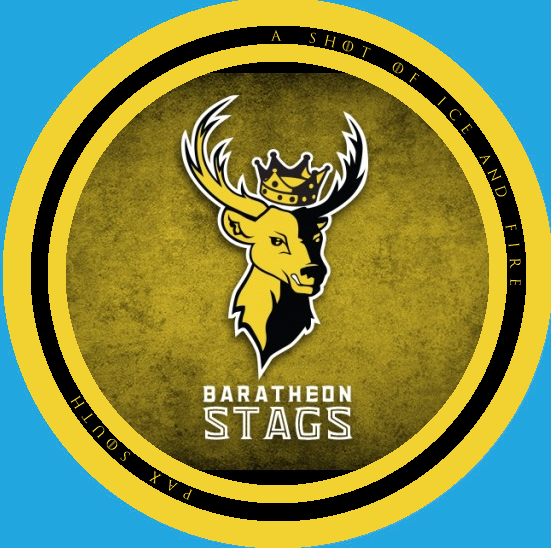 When you arrive at a bar with each successive house you can hold up your sigil card to identify each other as opposing teams. Then just pick someone (or someones, for those group sign ups), introduce yourselves, and head to the bar to buy your drinks. When you finish your drinks exchange one of your pins with your new friend to prove you completed the challenge. After doing your challenge I highly suggest visiting the house leads at each bar to see what sort of cool themed swag they're selling to maximize your drinking/charity giving ratio. Some of us will be cosplaying too, so lots of picture opportunities* while perusing our wares. So how much money should I bring for drinks on average? Drinks should be reasonable, I don't remember any of the bars being pricey but I don't drink in bars that often so I'm not the best person to ask about that. Meaning that the nominal participant will purchase 7 drinks throughout the night. Assuming $6 per drink (a conservative estimate) and a 20% tip to your bartenders, that's about 50 bucks. You'll also need a 10 dollar donation to start the night out and get your badges, plus extra to donate for handmade swag made by each house. I can't put an upper bound on how much extra to bring for this because it all goes to charity; spending money towards donations on this crawl is one of the few things in life that you can't have too much of. Plus, the swag you get is always, always awesome! If this is seeming like a bit much, keep in mind that the amount you drink is up to you; everyone has their own tolerances. You can switch back and forth from water at any point in the crawl to save your wallet and your head from hurting the next day. My travel plans changed and won't make it till very late Thursday night, there is now a spot available in the Wildlings. Y'all have fun!